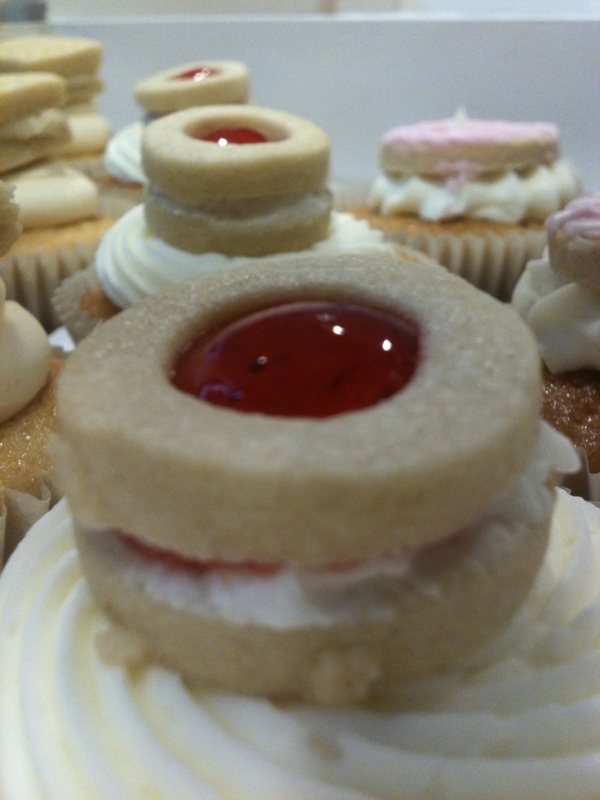 Time for another installment of the “party biscuit” cupcakes: Jammy Dodger cupcakes. These were just a mix of recipes I’ve made previously – my usual vanilla cupcakes, filled with jam, topped with vanilla buttercream, and my recipe for jammy bodger biscuits made into mini biscuits. Makes 9 large biscuits (see here) or loads and loads of mini ones! You will also need a small amount of vanilla buttercream for (see below for the recipe – you only need a small amount so I used what was left after making and icing the cupcakes. If you want to make a full batch of buttercream but aren’t making cupcakes at the same time then any leftover buttercream can be frozen). Place the dough on a floured surface and knead briefly. Roll the dough out to about 2-3mm thick and then cut out the desired shapes – I made 40 small circles and cut out even smaller circles from the middle of half of them. Place on a tray lined with greaseproof paper and then chill in the fridge for 30 minutes. Bake for around 6 (depending on the size of the biscuits – and bake the solid circle and the rings separately since the rings will brown/cook quicker) or until the biscuits are lightly browned around the edges. Place all the full circle on the side together and using a palette knife spread a small amount of buttercream onto each – don’t go all the way to the outside. Then place a dot of jam in the middle and spread it out evenly. 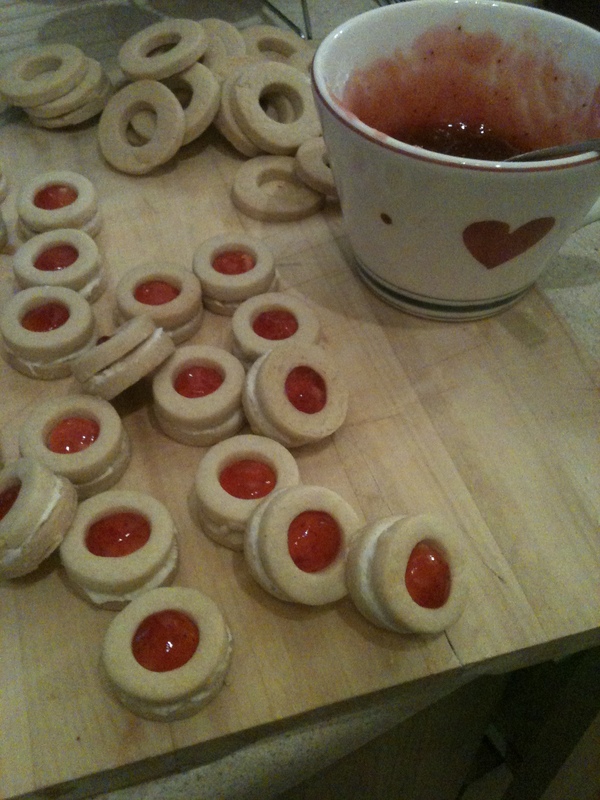 Take the “ring” shaped biscuits and place one on top of each of the jam and buttercream covered biscuits. 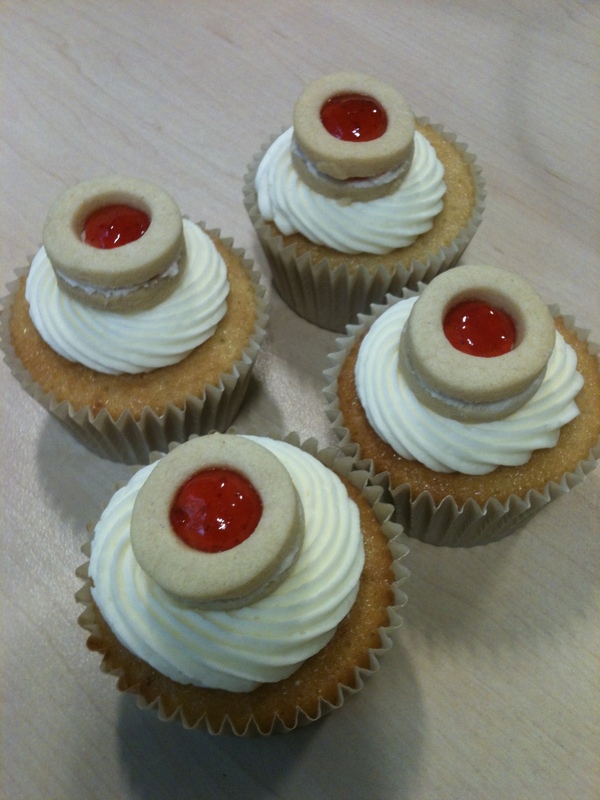 And to make the cupcakes to go with the biscuits here’s what you do…. Divide the mixture evenly between the 16 cases and then bake in the oven for 18-20 minutes until they are lightly browned on top and spring back when pressed (and a skewer comes out clean). Check them and turn them around after 15 minutes. Take out the tins immediately and leave to cool on a wire rack. Once completely cool, cut a core out of each one, fill with a teaspoon of jam and then replace the core. The pipe with buttercream (see recipe below) and top with a mini jammy dodger. Beat the icing sugar and butter together on a very slow speed until the mixture resembles coarse breadcrumbs. I always put a tea towel over the top of my KitchenAid to prevent icing sugar going everywhere! Then slowly add the milk and vanilla. Once it’s all been added increase the speed and beat on high for 5 minutes until light and fluffy. This is meant to ice 16 cupcakes but I always find I have some left over, so you can use the leftovers to sandwich the biscuits together.